Zubat in game: 3,287 Who? Important notice! Pokemon Zubat is a fictional character of humans. Zubat is a blue, bat-like Pokémon. While it lacks eyes, it has pointed ears with purple insides and a mouth with four pointed teeth. There are two teeth on both the upper and lower jaws, and a male will have larger fangs than the female. It has purple wing membranes support by two, elongated fingers, and two long, thin, tails. Zubat lives in abundance in caves. It has evolved to have neither eyes nor nostrils, instead navigating through dark environments with echolocation. As demonstrated in the anime, it will leave its abode at night with a mass of other Zubat in order to seek prey. 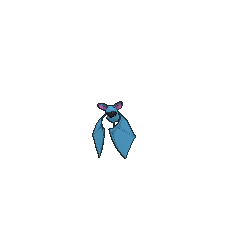 During the daytime, Zubat sleeps hanging upside down in caves, forests, or under the eaves of old buildings, avoiding sunlight at all costs. Daylight causes Zubat to become unhealthy, and prolonged exposure can even burn its skin. However, captured and trained Zubat have been recorded as being much more tenacious in the daytime, even when directly exposed to sunbeams. Brock had a Zubat that he caught in Clefairy and the Moon Stone at Mt. Moon. It later evolved into a Golbat and then into a Crobat during the Johto saga. One of Brock's love interests, Dr. Anna, used the Supersonic sound waves made by her Zubat (nicknamed Mimi) to scan her patients in Hassle in the Castle. Three Zubat appeared in Alola to New Adventure! under the ownership of a Team Skull Grunt. One of them reappeared in SM011. 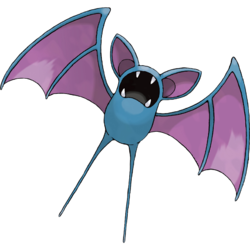 Like in the games, Zubat are commonly found in any random caves in the anime, and sometimes outdoors at night. Multiple Zubat also appeared in The Power of One and Destiny Deoxys. Another group of Zubat appeared in Leading a Stray! and A Rivalry to Gible On!. A Zubat appeared in Battles in the Sky!. A Zubat appeared in SM008. 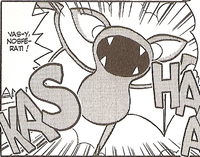 A Zubat was shown under the ownership of a Team Rocket Grunt that invaded the Goldenrod Radio Tower in The Legacy. Zubat makes a few cameos, first in the Red, Green & Blue chapter as a Mt. Moon wild Pokémon in Raging Rhydon. A Zubat appeared as a silhouette when Green explains about Mew in The Jynx Jinx. In Chinchou in Charge, a flock of Zubat and Golbat attacked Brock, Misty, & Erika while in Tohjo Falls. Another flock attacked Ruby in Granite Cave in Guile from Mawile. In Belligerent Bronzor, a Zubat appears under Commander Mars' ownership. Another Zubat appears under Executive Proton's ownership in the Fortunately for Feraligatr. 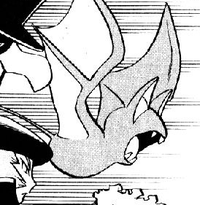 B-2 has a Zubat which appeared in Hareta's Very First Pokémon Battle!!. Mars also has a Zubat which had the ability of seeing in the dark after her Purugly turned off the power. 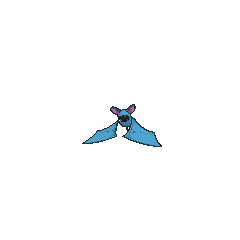 Zubat can be seen as a parallel to Noibat in several ways. They have exactly the same base stats with only their Attack and Special Attack swapped. 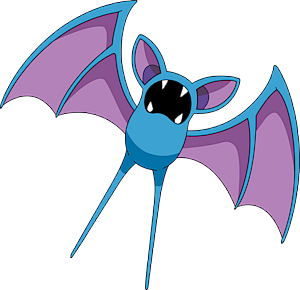 Zubat's design is inspired by bats. Its lack of eyes may come from the misconception that bats are blind.